Like a star which has expanded and now cannot maintain its grand state, Europe's extend-and-pretend economy is now poised to experience a supernova implosion. The costs of ill-conceived policies are always paid by someone--usually those with the least political power. In ill-conceived wars, the costs are paid by the soldiers on the ground and their families, and the civilians who suffer collateral damage. The costs of ill-conceived financial policies end up being paid by taxpayers, savers, borrowers and those who lose their jobs in the inevitable bust. Those who conjured up the disastrous policies slink away to plush villas or defend their stubborn addiction to failed ideologies in the media (see Keynesian Cargo Cult and Paul Krugman). The most ill-conceived financial policy of all is extend-and-pretend: extend-and-pretend means if a debtor is bankrupt, then extend him more loans to maintain the illusion of solvency. -- If a homebuyer has defaulted, give him new loans, or shift his loan off the books into zombie mortgage status. -- If a student defaults on student loans, shift the loans into forbearance, i.e. mask the default by putting the defaulted debt into zombie mode. -- If a bank is insolvent, give it unlimited access to unlimited lines of central bank credit and lower interest rates to zero so the bank doesn't have to pay interest on deposits. -- If a nation is bankrupt, extend it new loans. The official reason for extend-and-pretend is the belief that time will heal all-- that given enough time, all problems solve themselves via some sort of pixie dust. In essence, this faith that time will heal all is a delusional state of magical thinking, for extending and pretending only enables the kleptocrats and the elites benefiting from the failed Status Quo to continue holding power. As painful as it would have been, Greece should have been refused loans in 2010 and 2011, and been ejected from the euro. The situation was visibly hopeless to everyone then, and extend-and-pretend was never going to solve the structural imbalances in the Greek economy that had been furthered or enabled by the euro and easy credit. 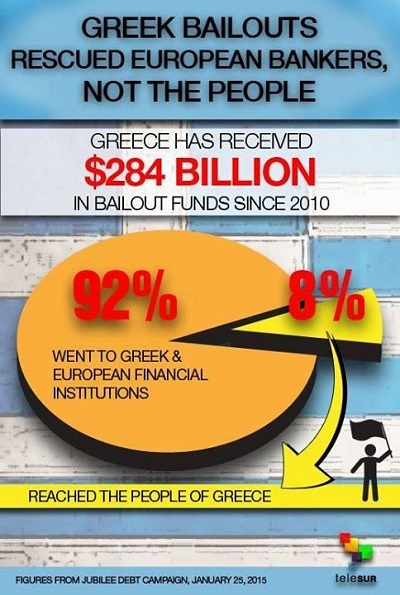 What did Europe buy with its $245 billion bailouts of Greece? Nothing. The $245 billion-- equal to the entire GDP of Greece--squeezed the citizens of Greece while leaving the kleptocracy in charge--the worst possible outcome. If policymakers had rejected extend-and-pretend and grasped the nettle in 2010/2011, Greece would be through the painful period of adjustment to its own currency. Deprived of the euro gravy train, its ruling kleptocracy would have collapsed or been ejected by the people as a failed regime. Thanks to extend-and-pretend bailouts, the pain of adjusting to reality is now being dumped not just on the people of Greece but on the people of every nation in the EU. Frequent contributor Mark G. explains why: most of the debt owed by Greece doesn't just vanish when Greece defaults--it must be paid by the other EU nations that guaranteed the debt. The structure of the EFSF and related packages means that if Greece will not/can not pay then every single guarantor country has to come up with fiscal appropriations to backstop any deficiency left by Greece in a default. This means going back to their national parliaments in most if not all cases for fiscal appropriations to do this. At this point what the Germans demonize as The Transfer Union will emerge stripped of all camouflage in all its hideousness. This is going to be politically explosive in itself for every one of these Eurozone governments. Nor is this confined to so-called "creditor" states, except in the sense that every non-defaulting state will be a creditor. So-called debtors and crisis states like Italy, Spain, Portugal and Ireland are all liable in large varying amounts as well as Finland, Holland, France and Germany. The first four, generally classed as being 'debt crisis' states themselves, are liable for a total of 240 billion euros as their end of the EFSF. Since Greece accounts for about 1/3 of the EFSF this works out to 80 billion euros for four weakened sates already experiencing their own Austerity. I cannot imagine that at this moment any of these cabinet politicians could tolerate a second budgetary line item that decodes as Additional New Money & Guarantees For Greece Under Tsipras/Varoufakis/Syriza. Greece can indeed initiate that process. And having done so, no one will have any further tolerance for Greece at the table. Their leverage begins and ends with default. The seeds of disaster were planted when Greece was first admitted to the ECB and euro under false pretenses. Extending imprudently massive loans to marginal borrowers always plants the seeds of disaster, and extending and pretending turns a potentially containable disaster into an uncontainable financial calamity. Yet this is the game plan of policymakers everywhere, from Europe to the U.S. to China--extend enormous loans to marginal borrowers and then mask the inevitable defaults with extend-and-pretend policies that vastly increase the size of the debt.